This weekend I decided to have a crack at baking brioche, which I've not done before. I've heard rumours that it can be very tough to bake, easily becoming dry or too dense. However, Dan Lepard has never steered me wrong, so I turned to his classic brioche recipe for this in his wonderful book Short and Sweet . His recipe starts by prepping the yeast first, so I heated 50ml of skimmed milk (purely because this is the only type of milk I had in the fridge) to almost boiling point. I then let the milk cool and added water to top the volume up to 50ml, accounting for the evaporated liquid. Following the recipe, I added 2 teaspoons of fast action yeast as well as 2 tablespoons from 400g of strong white flour which I'd weighed out separately. The recipe advised to stir well and cover the mix for half an hour, so I left it to bubble away whilst I enjoyed my morning coffee. Once my coffee cup was empty, I returned to the mix and combined it with 4 eggs, 3 egg yolks, 50g caster sugar, a little seasalt (the recipe advised one and a half teaspoons, but my tastebuds are quite sensitive to salt so I cut this back), and the remaining flour. I mixed this together to create a dough and, once again, put the kettle on and left the covered mix for half an hour. Now the fun bit - once the dough had rested, I could get kneading the super sticky dough. I started by kneading it on its own, but slowly added a little softened unsalted butter at a time until all 250g was added. Dan Lepard's advises to knead the dough 'as if you're energetically playing a sticky accordian' and there is truly no better way of describing it. It really is very fun, and I'd advise anyone to make this recipe purely for this grown-up play-doh! This recipe makes enough for two loaves, so I decided to split the dough in half at this point and knead an additional ingredient into each half. For one I chose just 125g chocolate chips (because who can say no to chocolate chip brioche? ), and for the other I added a combination of raisins and dried cranberries. The recipe advised to then cover and chill the dough overnight before baking it either the next day or the day after that. However, making two doughs allowed me the chance to experiment a little, so I decided to bake the chocolate chip brioche after 36 hours in the fridge but the fruity brioche after only 5 hours. Part of this was out of curiosity - chilling dough allows the gluten to relax, so in theory the chocolate chip brioche should end up lighter and with more developed flavours than its fruity sibling. I was interested to see how much of a difference to the texture/flavour of the bread this extra time resting would make. However, the main reason was really that I'd done my weekly shop and fridge space was limited! This recipe makes two loaves, each in fairly small 17cm loaf tins. Unfortunately both of my loaf tins were too big for this so I made lots of smaller loaves instead, which in my opinion look much cuter anyway. Who doesn't like tiny loaves of bread? Once in the pre-buttered tins, I covered them with a cloth and left them again for another 2 and a half hours. I then brushed them with beaten egg before baking for 15 minutes at gas mark 7 and another 15 minutes at gas mark 4 - Dan Lepard advises to bake for 20 minutes at this second stage, but the smaller loaves didn't need quite as long. The fruity loaf turned out well, with a light and buttery dough, but this only made me more curious to see how the next batch would turn out the following day! 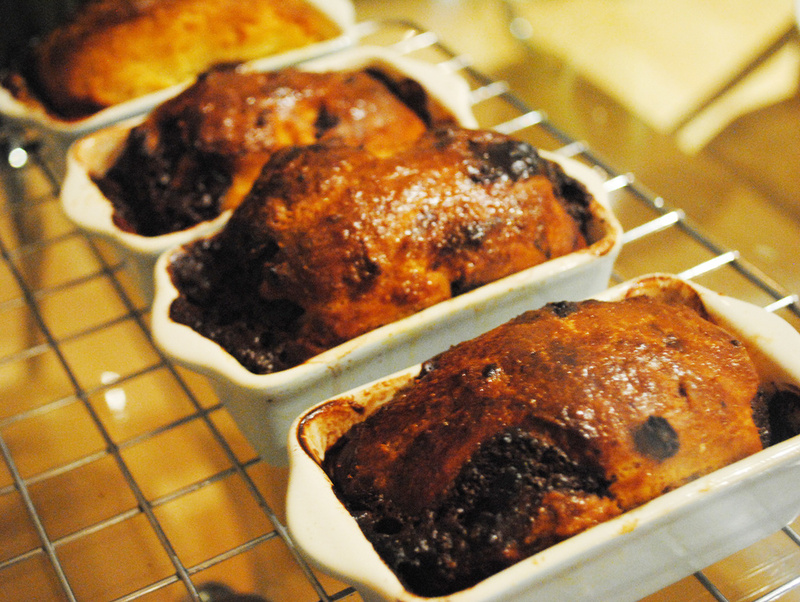 The next day, I baked the chocolate chip brioche in the same way and, as always, Dan Lepard is completely right. Whilst the fruity brioche was soft and sweet, the chocolate brioche had a greater depth of flavour and a lighter dough. It rained all over the fruity dough's parade. Moral of the story: when making brioche, be sure there's enough room in your fridge first!